Applicants who have completed graduate work in a field that is related to the department to which they seek admission may be eligible for transfer of credit to their New School for Social Research degree program. Credits earned more than ten years previous to the date of student's entry into the master's or doctoral program are not transferable. All transfer of credit is at the discretion of the academic department in consultation with the Office of Academic Affairs. 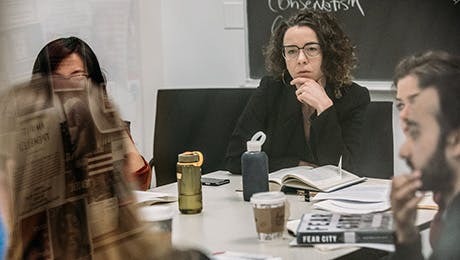 Applicants admitted to a master's program at The New School for Social Research may transfer to their program a maximum of 3 credits (equivalent to one course) from previous graduate study. To be transferable, credit must have been earned in a course that would fulfill the department's master's degree requirements at The New School for Social Research. Students whose previous graduate education includes more than 3 transferable credits may transfer the additional credits only if they are permitted to advance to PhD study. Students admitted directly to PhD study will be awarded between 21 and 30 transfer credits on the basis of previous graduate course work. To be transferable, credit must have been earned in courses that fulfill the department's master's degree requirements at The New School for Social Research.